Wireless networking with three times the speed and five times the flexibility. 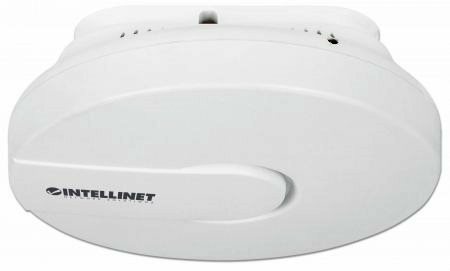 The Intellinet Network Solutions High-Power Ceiling Mount Wireless 300N PoE Access Point, Model 525800, is the latest in wireless networking. Taking advantage of new technology, a wireless network can now see greatly enhanced network speeds. The High-Power Ceiling Mount Wireless 300N PoE Access Point comes with a PoE PD port. This port can be used to power the device from a PoE-compliant LAN switch, which is very convenient in situations where AC power is not readily available.